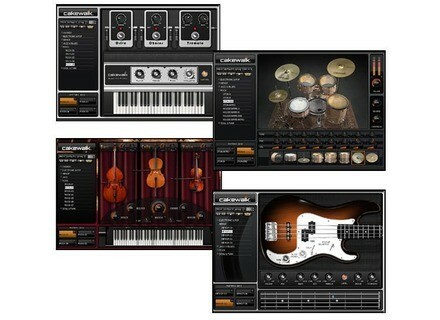 Studio Instruments, Virtual Intrument Bundle from Cakewalk. CakeWalks Studio Instruments is a bundle that you can purchase at an affordable rate. You will get some really good electric keyboard sounds as well as some drum sounds. I really wasn’t too happy with the strings for some reason because using all of my orchestra vst’s have spoiled me and now I look down apon most vst’s that have strings, but are fully focused on creating orchestra sounds. I feel the strings down sound authentic and they sound like plastic and cheap. But this bundle is worth the buy and you will get so man cool new sounds to mess with. The drum program, isn’t the best in my opinion they could have spent some more time developing and recording some good sounding drums and kicks and toms. The kicks do not feel real to me so I never use the kicks. Also, the The bass instruments could use some polishing as well. They are not the type of basses that I like dealing with and love the sound of. All of the interfaces are very easy to understand and operate, you will have no problem getting use to using the Studio Instruments bundle. Overall, don’t expect to get great quality sounds and patches at a price that you are going to pay to have this Studio Instruments bundle. I have not tried to use this bungle on my mac because of all of the bad things that I have heard when trying to do so. I will keep it right on my pc and be happy. I really don’t use it that much though because I don’t fee like that the quality is great, I have much better sounding instruments. Also I have much better sound instruments on some free vst’s. So don’t ask why I purchased this? Its ok though I guess if you don’t want to spend a lot of money. I use the bundled Cakewalk recently ... and unlike what I have read on this forum I am happy trs ... This must be 2 months that I ais and it honntement meets my expectations. I do not use virtual instruments, I live musician so I expanders, they are the ones I use, but the for the occasion I made a bundle fun with this history of sound practice IMMEDIATE and usable. Trs readable interfaces, sounds good qualitmme if they should retreat to get audio in the very substance, one must learn patience in life) and especially bargain prices. Trs sounds "small" (not a lot of "potato"), a limit SERIES 4 editable sounds but does not much even when, under Vista it must excute as Sonar administrator to ensure that their registration is valid. It cost really cheap at all, so for what it has cost a virtual machine exceptional given the modularity of the four basic sounds (chorus for electric piano, SETTING THE bass that sounds good , etc. ..). Report quality price: trs good quality for a price maudique my opinion. I would do this choice with the exprience? Plutt twice that, I expect to have money to buy other virtual machines, but I combined the expanders Cakewalk Virtual Instruments Bundle is IDAL. Résumé in a handy little app when you do not want to invest in expensive virtual machines, and when you want to stay in the LGAL. 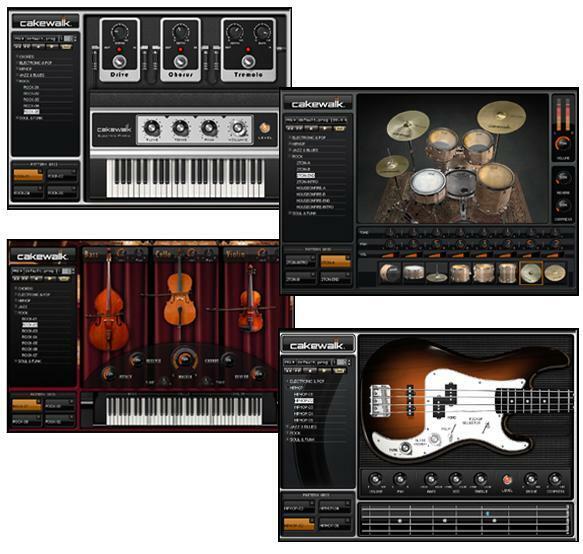 Anonymous 's review (This content has been automatically translated from French)" Good tools to start"
I purchased this pack because I was looking for VST virtual instruments affordable, somewhat in the spirit of those proposed with Garageband. With this package you end up with four instruments of good quality: An electric keyboard, drums, bass and finally the strings. These instruments have a clean and neat interface to many interesting settings and several presets that really affect the sound. I use fine with Reaper in Windows 7. - The battery is correct (for cons do not expect a sound level of EZ Drummer), the toms and cymbals sound fairly organic, only minus the bass drum is quite special and "vintage". His lack of power makes it inappropriate for some heavy music. - The electric keyboard is my favorite, it does not sound like a Rhodes but with built-in tremolo effect is quite illusion and I did not hesitate to put forward in the mix. - The bass is also excellent with many different types of sound and a significant burden, the modern one (the handle of a virtual bass can also enter notes directly without using a keyboard). - The strings are in my opinion the most dispensable VST lot for that price should not expect more, they are reserved for experienced users far behind and discreet. Finally a good buy for cheap that can effectively start computer music. Anonymous 's review (This content has been automatically translated from French)" I love this software from Cakewalk VST: 10/10." J'utilse since January 2010: 1 year & 4 months, this is super cool software compatible with Cakewalk Magix Music Maker & Samplitude Music Studio and other software: Garate: 100% Music. I essaiyé PRODIVER Fifth, I do not like at all: 4 / 10. I love everything to do with: 10/10. Qualities very, very, very good 50/50. I refer my chosen: yes: 10/10.